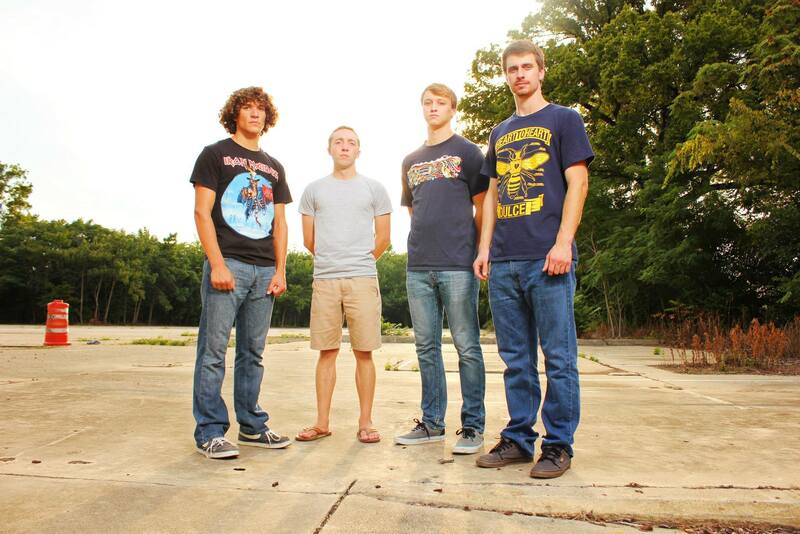 The following fill in the blank responses come from Virginia-based band, A Collegiate Affair. This 4-piece consists of members James Tuck (vocals), Dylan Morgan (drums), Mikey Stecher (bass), and Tim Fogg (guitar). Since forming in 2011, the band has released two EPs and a single titled “Calling Card.” They’ve also performed with many artists including Farewell, A Skylit Drive, and Red Jumpsuit Apparatus. In early May, the band released a new record titled Full Disclosure. They teamed up with Dan Uphoff at Full Circle Recording Studio to release the record which has a meatier, heavier sound. Learn more about A Collegiate Affair from their responses and stream Full Disclosure on Bandcamp below. Three words we’d use to describe us are….Hardworking, dedicated, and unmistakable. We’ve been a band for nearly four years and we’re self-taught musicians. We’ve worked our way out of the garage and onto some of the biggest stages in Richmond to support bands such as Red Jumpsuit Apparatus and A Skylit Drive. The story/meaning behind our name A Collegiate Affair is….We came up with the name A Collegiate Affair back in August 2011. It was 4am or something like that and we were having a discussion over Google chat. At that point in time, Mikey, Tim, and the other founding members had all just graduated from high school. Someone suggested that we name the group A Collegiate Affair since we were going to different schools so all agreed that’s what we should be called. Fast forward four years later and Tim and Mikey are still at Virginia Tech. Dylan graduated from VCU this May and James graduated over a year ago from Liberty University. We decided to keep the name after all the member changes because we had already established ourselves in the Richmond scene. It also still accurately describes our current situation. The pickiest eater is….Tim; He grew up in a household that didn’t eat spicy or oriental food, but he’s changed up his diet in the past few years to include more Mexican and Japanese food. The most OCD member is….It depends on the situation, but generally speaking it’s Mikey. He’s a perfectionist and nothing is ever good enough for him until it can’t be improved any more. For fun we like to….Go to concerts, hang out at James’s pool, and drink beer. We’re pretty laid back guys and we like to kick it and go with the flow. Mikey: My desire to write music is driven by an appetite to express my thoughts and opinions on a deeper level than words alone allow me to, so pretty much everything is inspirational to me. Tim: I find inspiration from others around me. I try and better myself every day in everything that I do. I want to make myself and my family proud of the things I’ve accomplished. One thing we want you to remember while listening to our music is….We try to be straightforward with everything we write. Nothing is fabricated. The first song we wrote together was….The very first song we wrote was Mission to Mars, but that was long before we had Dylan or James in the band so the first song that we wrote since adding them was Calling Card. It was a single we put out last October about staying true to yourself. We wrote the guitar, bass, and the song structure last spring and then James wrote a rough draft of lyrics for his audition; we didn’t give him any direction for the lyrics or cues for where we wanted the verse or chorus to start because we wanted to test him, and he blew us away by writing lyrics over parts that we thought would be instrumental. The combination of his voice and his different songwriting perspective is what convinced us to add him. Something we learned from creating Full Disclosure was….Creating Full Disclosure was a very long and rewarding process. We wrote some of the demos for the record in the spring of 2014 and we were able to perfect the tracks over the year. The biggest thing we learned is that we should never be contempt with writing a mediocre song. We had to rework a bunch of songs until we got them into a place where we thought they couldn’t be improved anymore. For example, ‘It Is What It Is’ was reworked like five times before we decided on the final structure. Overall, we learned to give ourselves ample time during the songwriting process to ensure we’ve arranged everything perfectly. Something odd we want our fans to know about us is….We eat Wendy’s before most practices and Waffle House after every show. There’s nothing like crushing the All-Star Special at the end of a great night. We’re absolutely terrified of….Getting our gear stolen from our practice space. The facility isn’t exactly located in the nicest part of town so it’s always a concern. We always make sure to triple check when we lock up each time. In the next six months you should expect….Regional touring and another short EP. We’re going to be doing some shows up and down the East Coast in July and then we’ll be hitting Valencia Recording Studio this August to record another EP. Be on the lookout for that in late September or early October. This entry was posted in Uncategorized and tagged A Collegiate Affair, A Collegiate Affair band, A Collegiate Affair interview, A Collegiate Affair music, band interview, fill in the blank interview, fill in the blanks, full disclosure, full disclosure album, interview, Virginia. Bookmark the permalink.